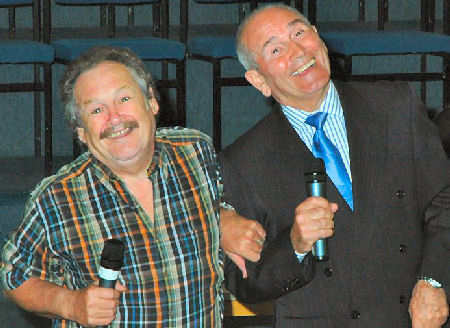 2008: Laughter topped the bill when well-known comedy duo Tommy Cannon and Bobby Ball were guests of The Salvation Army in St Giles St, Norwich on April 5. The evening of comedy and faith-sharing attracted an audience of around 430 people. Just when you thought you couldn’t laugh any more, Tommy and Bobby went offstage for a well-deserved break - giving the audience a chance to recover their composure, enjoy some refreshments, and listen to a short musical interlude. In the second half of the programme, both men talked very frankly about their lifestyles and how they had become Christians. Tommy had enjoyed the ‘perks’ of being a successful entertainer – unlimited alcohol, money, possessions - but nothing, he said, brought him lasting happiness. On one occasion, while appearing in a summer seaside show, he saw a boat in the marina and bought it on a whim for a large amount of money. “I didn’t need it – I live in York, what did I need a boat for?” he said. Recounting a similar experience – this time it involved buying a wig to hide his hair loss – caused much merriment. For about three years, Tommy and Bobby didn’t speak to each other, and went their separate ways. Bobby became a Christian, and finally persuaded a reluctant Tommy to come to his grandchild’s christening. Tommy had bad memories of church from childhood – especially vicars! – so he was pleasantly surprised when he met the one doing the ceremony, who certainly wasn’t the stereotype he’d imagined. He felt welcome, and at home – and that was the beginning of his own faith journey. None of those ‘perks’ matter to him now, he said, because in Jesus Christ he has found lasting satisfaction. Bobby spoke very frankly about the kind of person he had become – a heavy drinker and womaniser, who didn’t care about the hurt he was causing his wife and family. Strangely, it was another vicar who first challenged him to think about the claims of God on his life. Bobby gave powerful witness to the change that God had brought into his life, and invited others to make a commitment. In response, about 30 people moved forward to share prayer with himself and Tommy. At the conclusion of the meeting, the two men signed autographs and talked with members of the audience. It was a great night of Christian fun with a serious message of salvation reaching for everybody wherever we are in life.